From the block. For richer flavor and smoother melting. Reclosable pouch. Farmer owned since 1909. Tillamook County Creamery Assn. 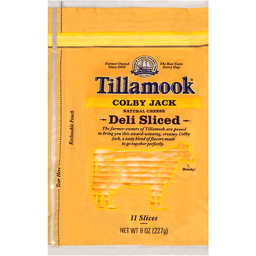 A Cut Above: The award-winning cheesemakers of Tillamook are proud to bring you are creamy Colby Jack, grated on the generous side - the way you do it at home. Our big-blade, farmstyle cut gives you larger shreds right from the block, for richer flavor and smoother melting. You'll find that it makes a real difference in everything you cook. Smile. 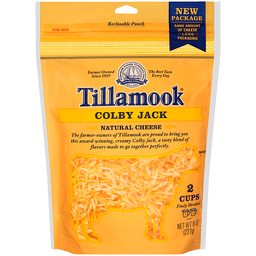 You're about to eat Tillamook Cheese. Thank you for buying Tillamook and helping keep our family farms strong. Made with pride by Tillamook County Creamery Association. No artificial growth hormones (All farmers who supply milk for Tillamook products pledge not to use artificial growth hormones). Single. Colby Jack: Smooth, creamy and deliciously mellow. Beyond great for mac &cheese, casseroles and scrambles. Rate the Grate: A guide to choosing the right cheese for your next great masterpiece. Culinary Character: Melt: 5; Stretch: 4; Sharpness: 2; Yum: 5. Questions? Comments? Please visit Tillamook.com/Contact. Contains no animal rennet (vegetarian). The FDA has stated that no significant difference has been shown between milk derived from RBST treated and non-RBST treated cows.